Help me save these poor little house plants? Hello all! I need your help please! 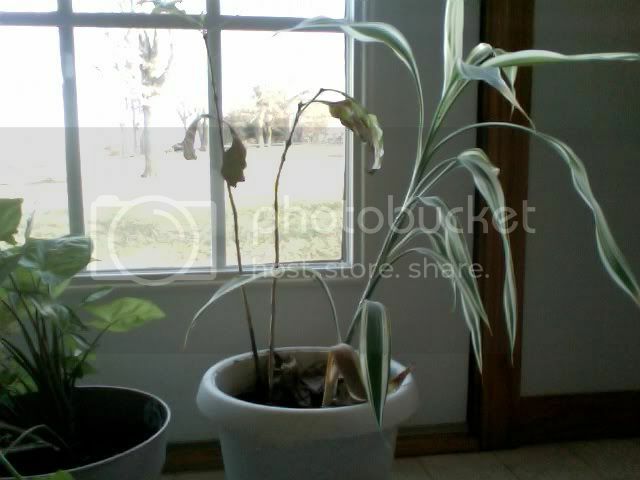 I work for a group home, and while the house and the people in it get good attention, these poor houseplants do not. With the exception of an aloe plant, I have no idea what these are -- I'm a bit new to this whole plants thing, but I love them!! I repotted a few of them yesterday because, had their pots had drainage holes, the roots would have been poking out. I know that aloe plants are pretty hardy so I'm not too worried about him, but the other ones are looking a little worse for wear. The ones I didn't touch are also not looking so good. I know when I'm not here they water the plants every day. My question is this -- what can I do to help them perk up a bit? I don't think they're ever in direct sunlight, but they are by windows that get light most of the day. Like I mentioned before I also think they get watered on a daily basis. This one was in a TINY pot. Its' roots were curled and snarled all together, I tried to keep as much of it together as I could, but the dirt was absolute MUD. I'm not sure if this one is going to make it -- any ideas? This one wasn't repotted, but just seems yellow around the leaves and dead-ish overall. 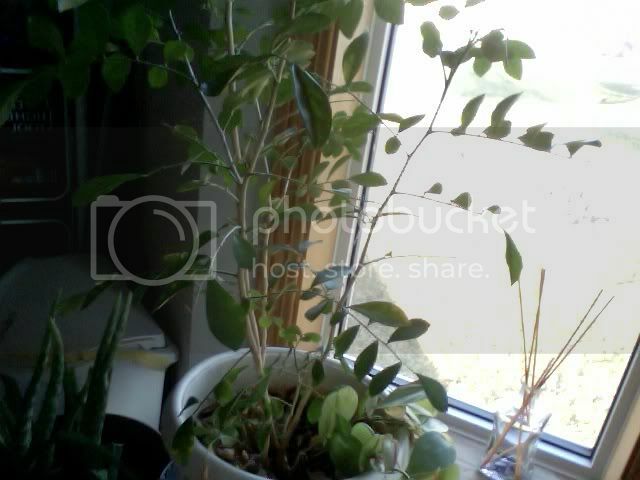 There is a vine type plant in the same pot. This one is actually the healthiest looking out of the bunch, not too much wrong with him, maybe just some care tips though? These weren't repotted either. They are pathetic... the ones on the left are different, they're slowly deteriorating, and the one on the right WAS ok, but now it is just getting yellowy. The leaves still feel healthy, but they just look yellow. Thank you so much for your help! I appreciate it!! I think you might have overpotted the arrowhead plant (Syngonium podophyllum). Too large a pot will promote root rot by staying damp too long. It makes it difficult to maintain the proper level of moisture. If you repotted it very recently, you might want to redo it in a pot 1 or 2 inches smaller in diameter. I'm not sure what the second plant is. 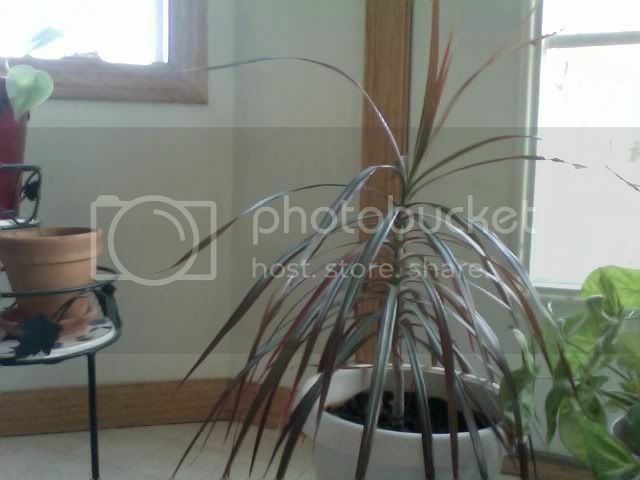 The third is Dracaena marginata, and looks to be in good shape. I would just continue treating it as you are, unless you have noticed it declining in some way. I'm sorry, but I can't ID the plants in the 4th picture, either. The sun in shining on my monitor, and I just can't see it well. If no one else responds, I'll try again later. I would say not to use any fertilizer at this time, certainly not on the plants that appear to need help of some sort. Fertilizer will just make things more difficult for them. I know you said you just repotted them, but make sure they're in good draining soil. Especially with inexpensive potting soils but even with the premium brands, I tend to mix in another 1/4~1/3 by volume sand or perlite. If you suspect they're being watered every day, it's absolutely essential that the containers have GOOD drainage holes. Many plastic decorative pots have tiny holes that are a joke, and often, have "attacheable" saucers that utilize the same holes and end up blocking them. It's better to use saucers that do not attach to the bottom in my opinion. If no one will take care to empty the saucers of excess water, the only thing you can do to ensure that the plants are not overwatered is to put the pots in a deep community trays filled with gravel or lined with cooling rack type of arrangement so the plant containers will stay above the water that drains out. 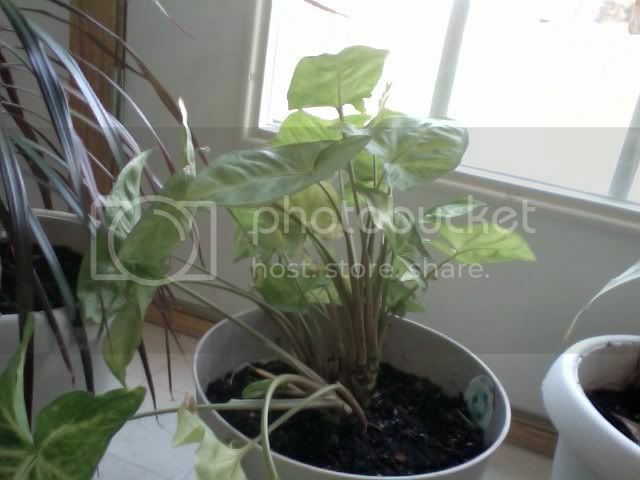 Most of the plants in the photos are houseplants that are adapted to low light conditions. No longer pot-bound and with better watering regimen, they should perk up in a week or two. Since most potting soils contain added fertilizer, I wouldn't worry about fertilizing for at least a couple of months. If you're using chemical fertilizer, you don't want to over fertilize or the salt build-up will kill them. Would it be better to water every other day, or every couple days? I can try to leave it in the notes and see if someone will work with me on this.. Thank you guys so much for your input!! I have a Pothos and a Monstera (almost indestructible house plants), and they're lucky to be watered once a week. Until the drainage situation is figured out, the plants are in more danger from drowning than dehydration. Good for you, taking care of them! Definately don't water every day, or even every other day unless you have the fastest draining soil or it's really hot and dries out fast. Especially this time of year, over watering can be lethal to plants. You can't pick a set schedule either, you just gotta stick a finger down in the dirt and see how wet it is. The second pick that has two different plants in it, with one said to be vining? I can't ID from the photo, but the back plant could be a Ficus benjamina, judging by the trunk alone. Do the leaves come to a thin point? No ideas after that on that pot of two plants. The third may be a Dracaena marginata as previously mentioned, but if it's not getting a lot of light, they aren't that red. Just a green leaf with red edges or a variegated ivory pink and green stripe. It may be a cordyline of some sort, with somewhat different needs than D. marginata. It does look reasonably healthy, though. The first pic with the Syngonium podophyllum is probably in too large of a pot, it's true. However, it does look reasonably healthy at this point. That floppiness will resolve either in this pot or in a smaller pot once the plant adapts to the growing medium. If it was root bound as it sounds it was, you needed to loosen that ball of roots up a bit, just tease the outer coils of roots loose so that it can spread them out and grow. Very easy to grow, all of these plants that can be ID'd. Sum-1 Please help my poor plants. Is it possible to save strawberry plants? How do I Keep House Flies off my Plants?